Symbols on the paytable are themed, looking much like world-famous hieroglyphs representing Egyptian pharaohs and deities such as Horus, Ra and more. They naturally hold much higher payout rating that stylized playing cards from Tens to Aces, but in any case you’ll need a combination of 3 or more matching items on an active payline in order to get paid. With just enough demo credits, it is possible for a free play to learn how to win without any real money investment. This is also a chance for newbies to work on a specific betting strategy later to be implemented in the real game. The coin value ranges from €0.01 to €1 and you can place bets in the range from €0.10 to €10 per round. The game’s main item – the Book – has a dual nature. First of all, you can use it as the Wild and let it substitute any other symbol to form a winning combination. When 5 Wilds appear on an active payline, the winners get to enjoy the static jackpot of 500 coins. Moreover, the Book of Gold: Double Chance Bonus round starts when you collect 3+ Scattered Wilds. You’ll be rewarded with 10 Book of Gold With 3 Scattered Wilds: Double Chance free spins. During this round, 2 randomly chosen symbols will turn into Special Expanding Symbols. In case the entire reels get filled with them, the winners receive the big win. Moreover, you can re-trigger this round over and over again and play with the same set of normal and expanding icons. Is it possible to play Book of Gold: Double Chance on my mobile device? What is the RTP factor of Book of Gold: Double Chance? According to official info, The RTP factor of the book of gold: Double Chance stands at 95.04%. The game has high volatility combined with much higher payout frequency. You should definitely use the Book of Gold: Double Chance tips and this way improve your winning great odds. 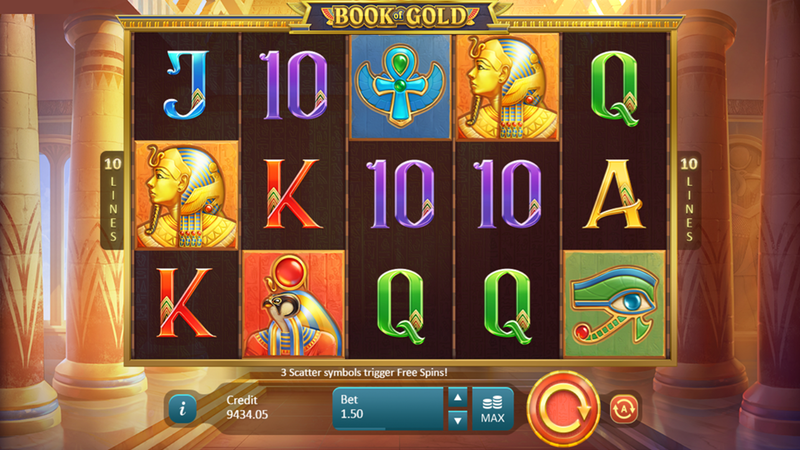 Book of Gold: Double Chance is the Ancient Egypt-themed video slot machine released as the fourth in the series of games Playson and published during 2018. Built on the 5-reel 3-row setting with 10 fixed pay-lines, the game features unique Free Spins rounds with expanding Scattered Wild increasing your odds to score a big win. Read the Book of gold double Chance slot review to explore the pyramids and find the hidden treasure.